Laparoscopy is the insertion of a thin, rigid, fiber-optic camera into the abdominal cavity. Once the camera is in place, the abdomen is insufflated with CO2 in order to better visualize the organs contained within. Our veterinarians are able to visualize the procedure being performed on our 55” flat screen monitor located in our state of the art surgery suite. After the procedure is performed the CO2 is removed from the abdomen. This form of minimally invasive surgery allows for less tissue trauma, smaller incisions, reduced pain, and faster return to function compared to traditional “open” techniques. Because the incisions are smaller there is less risk for bleeding, less risk for dehiscence (opening of the incision), and less time taken to close the incision with sutures. What all of this equates to for you as an owner is peace of mind, knowing that you are providing the absolute best for your pet in terms of minimizing risk and decreasing potential discomfort. This procedure is a type of spay where only the ovaries are removed. Research performed in the United Kingdom has shown that this procedure is less invasive and can result in much faster return to function with less pain and discomfort. Just as importantly, this procedure puts the pets at no more risk for mammary cancer, pyometra (infection of the uterus), and endometritis (inflammation of the lining of the uterus). View a video of the procedure here. Cryptorchidism is a congenital (present at birth) defect where one of the testicles remains retained in the abdominal cavity and does not descend into the scrotum. By performing cryptorchid surgery with the laparoscope we are able to create a much smaller incision and obtain greater visualization of the structures in the caudal (towards the pelvis) abdominal cavity compared to traditional open techniques. Gastropexy is a stomach tacking procedure used in large and giant breed dogs in order to reduce the chance of GDV (Gastric Dilitation and Volvulus). 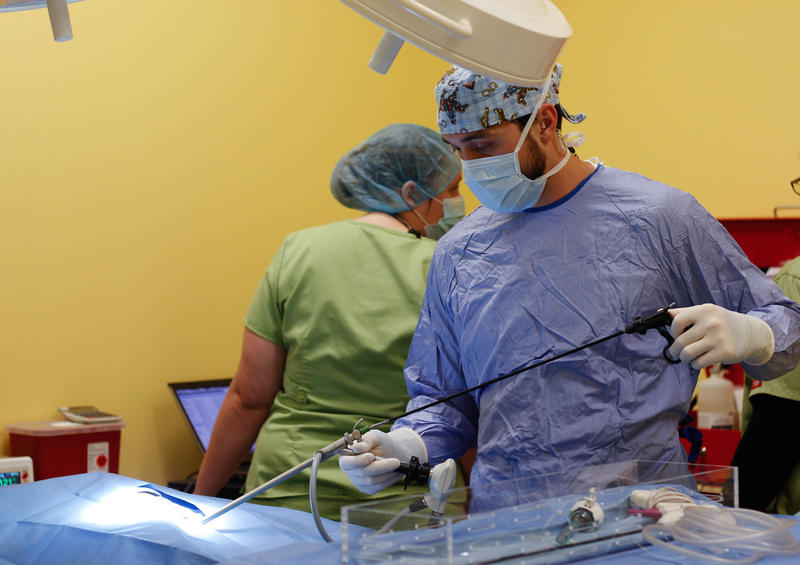 By using the laparoscope we are able to perform this procedure faster than a traditional open technique due to the incision being much smaller and less closing stitches being required. What this means for your dog is less time under anesthesia and as such decreased anesthetic risk. For certain conditions affecting the liver a piece of tissue (biopsy) is required in order to gain a definitive diagnosis of the disease process. By utilizing laparoscopy we are able to gain access to the abdomen and visualize nearly the entire liver and obtain a biopsy sample. All of this can be accomplished through a much smaller incision and much less tissue trauma compared to an open technique.